Frequently Asked Questions and Answers (FAQs) for Dotworkz products and resources. What are the advantages of a quality US-made camera enclosure system? Over the last 19 years Dotworkz has been fine-tuning weather and environment resistant materials. Dotworkz provides vandal tough, weather, and ballistic resistant materials as standard options for all outdoor housings options. This enables security designer architects to deploy cameras of all makes and models where they are most needed – outside. The Dotworkz camera housings are favored by install professionals because they are incredibly easy to install, work with, and look new many years after other housings rust and corrode. What standards do Dotworkz housings have that others don’t? Dotworkz has been promoting the IP 66, IP 67, IP 68, NEMA 4 and IK 10 protection standards into a “real world” proven product that truly protects cameras and other electronics for the long term. The Dotworkz product line is unique in that housings are engineered to protect all brands and sizes of cameras against hazardous weather environments and vandals. Why does Dotworkz provide so many climate control options? Dotworkz understands the challenges of placing sensitive electronics (network cameras, micro NVRs, 4G wireless, etc.) into hostile and remote location. The proper hardware must be used so the system can perform in the in the harshest environments. Dotworkz considers the housing’s internal temperature controls to be a key factor for a reliable deployment. For example, a heater and blower combined with a HD camera installed in a desert climate will only produce heat related failures over time. Dotworkz COOLDOME™ Series active cooling option extends maximum external temperatures up to 167° F (75° C), and is the ideal protection for cameras deployed in extreme hot and desert climates. Contact Dotworkz for a live demo or camera uplink to see the systems work and interact with certain climates. How can long-term reliability be tested? Dotworkz has been deploying extreme housings in all corners of the world since 1998, and the feedback gained from clients in these areas goes straight into product designs. This allows Dotworkz to continue creating and updating high-quality products meant for long-term use. Mean Time Between Failures (MTBF): The predicted elapsed time between inherent failures of a system during operation, and Dotworkz integrated power components have been lab tested to meet or exceed MIL standard MIL-HDBK-217F (25°C) military testing standards for electronics or International Electrotechnical Commission (IEC) 61709 testing standards. The Dotworkz Heater Blower, Ring of Fire, and Tornado MVP models power supplies have been tested to 353,600 hours (40 years) minimum of continuous reliable service rating. The Dotworkz COOLDOME™ models power supplies have been tested to 238,900 hours (27 years) minimum of continuous reliable service rating. How do high-end offerings differ from low-end ones? Most low-end products look good initially, however over time many unforeseen problems present themselves. Issues such as insect nesting inside the camera housing and lens can seem minor, however it severely compromises a camera’s vision within 6 months of the installation date; resulting in an expensive service call. Similar issues can be seen when water leaks inside, and then freezes or creates rust inducing condensation. Dotworkz products have been engineered with these real world factors in mind, so the problems are not repeated in future products. All Dotworkz enclosures are fully sealed to IP66 and IP67 standards. Dotworkz housings are marine environment ready, with all exterior components made from non-corrosive materials including stainless steel hardware and tough materials. What are some selection criteria when selecting housings? Extreme temperatures and humidity, dust and salt, maintenance and warranty, and vandalism, should always be considered when selecting a housing. Dotworkz offers products built for specific temperature and humidity ranges. One small heater fan can do very little in extreme climates, and specialized products are needed to accommodate weather specifications. Dotworks housings have an IP 66 rating, and effectively protects against dust and moisture in hostile environments. Dust and salt can begin building up on camera housing lower lenses 10 days after the initial installation. This can render video technology unusable and high-performance cameras inefficient in low light. This is why proper maintenance with the correct tools is a consideration that should not be over looked. 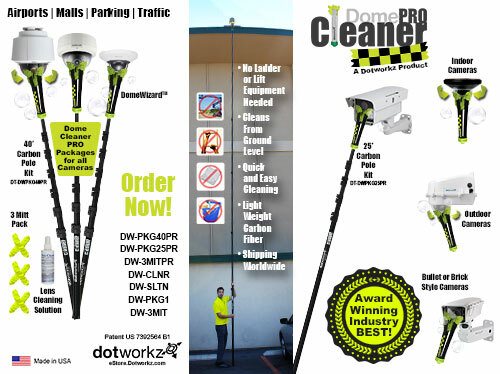 Dotworkz offers a dome cleaner product suite designed to safely clean all shapes of exterior lenses and cameras housing from the ground-level. Dotworkz housings are vandal tough in that they are constructed from a virtually indestructible, heavy-duty, non-metallic, non-corrosive, and flame-resistant Polycarbonate Thermal Plastic with lockable cover system. Also, products with misleading marketing names such as “arctic” or “cooled” should be researched closely before purchasing. These “buzzword” terms often confuse the buyer into believing a product will perform a certain task, only to cause serious issues after installation because the housing is not equipped to handle the environmental conditions. How much room is available for hardware in a Dotworkz D Series housing? Dotworkz PTZ and mini dome camera housings are very unique products, and are currently available two form factors, the D2 and D3. There are several factors that make the D Series unlike other models. The D Series shape is inspired by a modern-day SUV, using a different approach from the standard “tear drop” dome. This unique shape allows room to build a camera system specific to the needs of different environments and deployment situations. The D Series has five environmental options to work within any climate or purpose: Base Model for vandal and water protection (includes no internal electronics and is for indoor deployments); standard Heater & Blower (for cold/warm temperate climates); Tornado (for humid/coastal areas); Ring of Fire (for extreme cold); and COOLDOME™ (for extreme heat/arid/desert areas). The D Series hinge opening allows the space necessary to create an outdoor camera system that can include electronic components such as small network switches, video encoders to connect to existing analog cameras, indoor wireless solutions, etc. The D2 has roughly 964 cubic inches of volume, while the D3 has 50% more volume than the D2, at roughly 1,453 cubic inches. Dotworkz D Series enclosures eliminate the need to use high-cost outdoor-rated radios and wireless devices. More cost-effective indoor models are completely protected from the elements inside the D Series IP66 rated housings. This provides substantial saving per unit while improving aesthetics because there is no longer a need for multiple devices on a pole/wall. Everything is housed inside an aesthetically-pleasing, vandal-resistant, geographically-based weather-protected enclosure. Why does the exterior/outside fan on the COOLDOME™ appear to activate randomly? While the interior fan is always on with COOLDOME™ (as it is with all Dotworkz powered enclosures), the exterior fan is controlled by the thermostatically activated A/C cooling. When the cooler is off, the exterior fan is off, and when cooler turns on so does the exterior fan. The Multi Volt Platform (MVP) is a standard feature that is included in most of Dotworkz outdoor camera enclosures. MVP makes the process of ordering, designing and installing electronic devices within housing systems very simple. The MVP product can receive either 95 to 264 VAC, or 20 to 30 VAC/VDC as an all-in-one simple system that powers cameras, wireless, mini NVRs or other devices (up to 26 W) without having to run extra cables or power supplies. What sort of benefits does MVP offer? The MVP allows for a flexible way to install cameras with the option of adding additional accessories in order to create a “complete system”. MVP provides power internally for wireless, NVRs, cell routers, fiber, Ethernet extension, etc. What is the input and output voltages for a MVP? “Input” voltage refers to the voltage available to power the enclosure at the installation site. The input voltage range for all MVP models is 95-264VAC, and the MVP can also be powered using 20-30VAC/VDC. “Output” voltage refers to the voltage necessary to power the camera or accessory. The output voltages provided in all MVP models is 12VDC, 24V. Is MVP included in the Dotworkz products or is it sold separately? The MVP is sold as an integrated feature with Dotworkz Heater Blower, Ring of Fire, and Tornado D-Series and S-type housing systems. The COOLDOME™ models and Solar Ready products are currently the only Dotworkz enclosures that do not have MVP available. IP stands for “Ingress Protection” rating, and is a code that classifies the degree of protection provided against the intrusion of water and solid objects (such as dust and fingers) in mechanical casings with electrical enclosures. What is the power usage of my enclosure when powered by low voltage inputs? The D2, D3, and S-Type series have identical power usage figures for all MVP models: Heater Blower (HB), Tornado (TR), and Ring of Fire (RF). The COOLDOME™ (CD) series also has identical power usage for the D2 and S-Type models, however the D3 COOLDOME™ (CD) uses a dual cooler which doubles the peak power consumption over the other COOLDOME™ (CD) models. Dotworkz has tested the majority of models using a special 25 watt resistor for camera load simulation. Most cameras will create a lower overall power use from model-to-model. Please read test conditions on each model, as some will allow for added camera power load. These are for exact power usages, but when designing a system please use transformers or power supplies with a 30-50% higher maximum power rating (VA or wattage) in order to create a robust and reliable power system. What is the difference between the types of D-Series enclosures lens? When designing a lens, there is a tradeoff between material thickness and durability, i.e. the most durable lens bubble will be thicker, but will have lower optical clarity, and a thinner lens will have better optics, but lower durability. The Optically Pure Lens is made for all cameras, and is optimized for 40X optical zoom rates. It will provide the clearest image at full-zoom-rate for any zoom camera. It is made of acrylic, which has the best optical clarity of common thermoplastics. The Optically Pure Lens is available upon request at time of order at no charge, and is also sold separately as a replacement accessory. The tinted lens is also available and can be requested at the time of purchase. The Vandal Tough Lens was made for cameras 27X optical zoom or less, and is also made of optical grade acrylic. The Vandal Tough lens is roughly twice as thick as the Optically Pure Lens, and is much more durable. In addition, there will be virtually no visual difference at or below the 27X full zoom rate. The Vandal Tough lens is the default standard lens on production D2 and D3 models. The heavy-duty “DuraView” (product# KT-CLNS-DV) lens bubble from Dotworkz is a soon-to-be-released lens that can withstand the most stringent impacts. It is made from Polycarbonate thermoplastic, as are all of the D2, D3, and S-Type housings. Polycarbonate (PC) is the same material used to construct football and motorcycle helmets and is extremely strong, shatter-resistant, and preserves these characteristics over wide temperature ranges. This material is also used to make the new F22 Raptor jet-fighter canopy, the largest molded production use of PC plastic. Dotworkz uses this heavy-duty material for extra-tough deployment needs. We are currently recommending this lens option for cameras of 10X zoom or under. It has an extended upward viewing angle, and is ideal for deployments that require the camera to be mounted at lower levels. This option is targeted to be released in the very near future. Do you offer a Tinted/ Smoke colored lens? Yes, a tinted lens can be requested at the time of purchase, and must be specified on the purchase order. Otherwise it is sold separately as a replacement accessory. Tinted lens improves daytime viewing in bright conditions and increases camera privacy. This option is available in both Optically Pure & Vandal Tough lenses for D2 & D3 enclosures. How do I use my DomeWizard™? Apply dome cleaning solution to moisten your mitt, making sure it’s not too moist but moist enough to clean the surface. Make sure the DomeWizard™ is firmly affixed to the extension pole and adjust to proper height. For static enclosures, use the outside portion of the microfiber cleaning mitt to clean the flat lens surface. For minidomes and PTZ enclosures, spread the wizards fingers around the dome lens and lightly pulse the DomeWizard™ up and down applying light pressure, on the down stroke give it a slight twist. Light pressure is all that is needed for crystal clear results.